Dental crowns in Jacksonville FL are tooth-shaped coverings that help restore a tooth to its normal appearance. 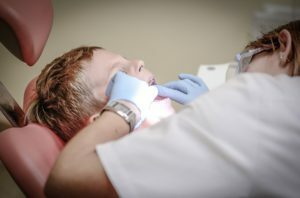 In pediatric dentistry, it can become necessary to use dental crowns in order to restore and save a tooth. Since the enamel on the outside of each tooth is thinner than a permanent tooth’s enamel, decay can spread much more rapidly between the teeth. When a crown is used to preserve one tooth, it is actually also helping to prevent the spread of decay to other teeth. By using a dental crown instead of extracting a tooth, it can also help to save the space for future adult teeth and prevent the other primary teeth from moving around. Teeth serve many purposes in the mouth, and a dental crown can help ensure these purposes continue. Speech development, the development of the jawbone and muscles, chewing food, and symmetry of the face can all be negatively affected by a missing tooth in a child’s mouth. Also, if a child needs to get a pulpectomy, a dental crown will be used to restore the top of the tooth after the pulp has been removed. There are many materials used in the creation of dental crowns in Jacksonville FL. Stainless steel is often used for molars while veneered steel is often used for the front teeth. Dental Crowns are much sturdier than fillings (Read More), and will generally last until the tooth falls out naturally around the age of 12. If, after your child gets a crown, he or she complains about the tooth feeling weird or funny, please let us know. Sometime a crown will need to be adjusted to get the ideal fit. Contact us to learn more about the services we offer to our patients. We are convenient to patients in Jacksonville, Jacksonville Beach, Ponte Vedra, Southside, Mayport, Florida, and in the surrounding communities.